The Committee of 300 is a product of the British East India Company’s Council of 300. The East India Company was chartered by the British royal family in 1600. It made vast fortunes in the opium drug trade with China and became the largest company on earth in its time. Today, through many powerful alliances, the Committee of 300 rules the world and is the driving force behind the criminal agenda to create a “New World Order”, under a “Totalitarian Global Government”. There is no need to use “they” or “the enemy” except as shorthand. We know who “they”, the enemy, is. The Committee of 300 with its “aristocracy”, its ownership of the U.S. Federal Reserve banking system, insurance companies, giant corporations, foundations, communications networks, presided over by a hierarchy of conspirators ~ this is the enemy. Secret societies exist by deception. Each is a hierarchy with an inner circle at the top, who deceives those below with lies, such as claiming a noble agenda; thus, duping them into following a web of compartmentalized complicity. 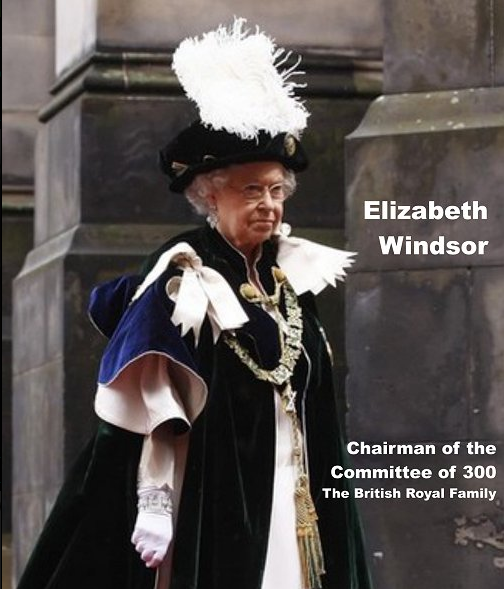 The inner circle of the Committee of 300 is the Order of the Garter, headed by Queen Elizabeth Windsor II. The Committee of 300 uses a network of roundtable groups, think tanks and secret societies which control the world’s largest financial institutions and governments. The most prominent of these groups include Chatham House, Bilderburg Group, Trilateral Commission, Council on Foreign Relations, Ditchley Foundation, Club of Rome, RAND Corporation, PNAC and of course Freemasonry. 15. To export “religious liberation” ideas around the world so as to undermine all existing religions, but more especially the Christian religion. This began with the “Jesuit Liberation Theology”, that brought an end to the Somoza Family rule in Nicaragua, and which today is destroying El Salvador, now 25 years into a “civil war”. Costa Rica and Honduras are also embroiled in revolutionary activities, instigated by the Jesuits. One very active entity engaged in the so-called liberation theology, is the Communist-oriented Mary Knoll Mission. This accounts for the extensive media attention to the murder of four of Mary Knoll’s so-called nuns in El Salvador a few years ago. The four nuns were Communist subversive agents and their activities were widely documented by the Government of El Salvador. The US press and the new media refused to give any space or coverage to the mass of documentation possessed by the Salvadorian Government, which proved what the Mary Knoll Mission nuns were doing in the country. Mary Knoll is in service in many countries, and placed a leading role in bringing Communism to Rhodesia, Moçambique, Angola and South Africa. 20. To organize a world-wide terrorist apparatus and to negotiate with terrorists whenever terrorist activities take place. It will be recalled that it was Bettino Craxi, who persuaded the Italian and US Governments to negotiate with the Red Brigades kidnapers of Prime Minister Moro and General Dozier. As an aside, Dozier was placed under strict orders not to talk what happened to him. Should he ever break that silence, he will no doubt be made “a horrible example of”, in the manner in which Henry Kissinger dealt with Aldo Moro, Ali Bhutto and General Zia ul Haq.